Since everything is digital, it should be easy to share, but short of passing around iPads and phones it’s actually very hard to do when you’re on the road. If you’re travelling on long car journeys with children, the MediaShair 2 makes it simple to stream video to up to seven devices. The same applies to documents, which makes this palm-sized device useful for business teams working abroad. 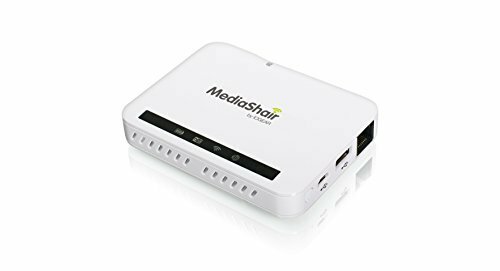 The MediaShair 2 produces its own Wi-Fi signal, and any phone or tablet with the free MediaShair app installed can fetch video, photos and documents, and play them back through any media software already on their device. Does that mean you’re restricted to Apple-approved media file formats? Actually, no; if you install more liberal apps, such as VLC, you can play any video format. It’s not just phones, either; laptops can also trade files back and forth using MediaShair, even if they’re using a VPN. Streaming is really fast, and although we did not test this with seven devices, a couple of phones and two tablets were able to stream in high quality very easily. The battery lasts for about nine hours, though it can also be used to charge a phone or tablet via USB, which is a nice extra especially if you’re travelling in a small group and you don’t mind using up that extra power. Physically, the MediaShair 2 has slots for a USB stick and SD cards. The MediaShair 2 would also be handy for small groups working abroad. As well as streaming files, the MediaShair 2’s Ethernet LAN slot means it can be plugged-in to a wired internet connection before creating its own Wi-Fi network. However, the killer app for most travellers is probably the sharing of photos. Take an SD card from a camera, put it in the side of the MediaShair 2, and then inspect the photos on a tablet. Of niche appeal, though incredibly fast and reliable, the only downside to the MediaShair 2 is that devices using it can’t see files on other attached devices. It means that the MediaShair 2 does need to be preloaded with content before a trip, photos aside, but with some preparation this good value device does what it promises and, crucially, uses a highly functional yet simple app.